The Bobcat is a medium sized cat and it is named after its short "bobbed" tail. They have a body length between 65 and 110 cms (26 - 43 inches), a tail length between 11 and 19 cms (4.25 - 7.5 inches) and they weigh between 4 and 15.5 Kgs (8.75 - 34 lbs). Bobcats have light grey or brown fur with a light coloured underside. They sometimes have spotted or striped markings which helps them to blend into their environment. 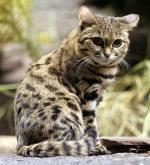 They have tufted ears, ruffs of fur on their cheeks and a short bobbed tail that is tipped in black. 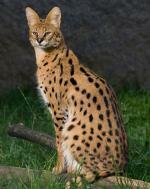 They are heavily built cats and they have excellent vision and hearing and a good sense of smell. They are adept climbers and they can swim if required, although they try to avoid water. Bobcats are found on the Canada/USA border down to Mexico. In the North they inhabit forests, in the Florida area they inhabit swamps, and desert and scrub land is where they are found in South West USA. They are solitary animals, only coming together to mate. In summer males have territories in the region of 40 Kms (25 miles) but in winter these increase to approximately 100 Kms (62 miles). The territories of male Bobcats often overlap those of other male and female Bobcats, whereas females have territories that are 2 - 3 times smaller and they do not overlap other female territories. Bobcats that live in the North will mainly feed on snowshoe hares and those that live in the South will mainly feed on cottontail rabbits. 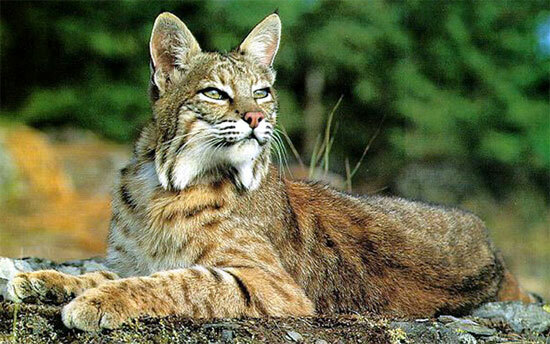 Rodents, bats and birds will also make up a Bobcat's diet. When food is scarce the male Bobcats will hunt larger prey such as deer. After a gestation period of 50 - 70 days a litter of 1 - 8 kittens are born (average is 2 - 3 per litter). The kittens are born with plenty of fur and they will already have their markings. They will weigh between 280 and 340 g (0.6 - 0.7 lbs) and they will measure 25 cms (10 inches) in length. Kittens are usually born between April and May but sometimes a second litter is born around September. The female gives birth in a secluded den such as a small cave and she will raise her young alone. When the kittens are 9 - 10 days old they will open their eyes and within 4 weeks they will be exploring their surroundings. When they are 2 months old they will be weaned and they will be independent after 1 year. Predators of the Bobcat include mountain lions, coyotes, wolves and humans.